I think that @Notsosureofit's numbers are for the Flight Thruster (instead of the Demo he references to). I base that on the frequency (3.85GHz) quoted by @Notsosureofit. Do you have a reference giving frequency, Q, power and thrust measurements for the Flight Thruster? This is the only reference I have for data for the Flight Thruster: http://emdrive.com/flightprogramme.html, I can't find a Q reported for these Flight programme tests. This is the only reference I have for data for the Flight Thruster: http://emdrive.com/flightprogramme.html, I can't find a Q reported. The Flight thruster programme covers the design and development of a 300 Watt C Band flight thruster. This has a specified thrust of 85 mN, and a mass of 2.92Kg. Overall dimensions are 265mm diameter at the baseplate and a height of 164mm. Development testing of the unit, up to a power of 600 W, is under way, and to date, has given a mean specific thrust of 330 mN/kW. This is needed to ensure the input frequency matches the resonant frequency of the high Q (60,000) cavity, over the full input power range and the qualification temperature specification. The Dynamic performance of the non superconducting Flight Test model, manufactured and tested by SPR Ltd, and described in REF 3 [N.B. : 2010 Toulouse TECHNO DIS paper] was modeled with a cavity Qu = 50,000 and Fres=3.85 GHz. Still have question about the Shawyer "Demo" cavity w/ 174mN. What are the current estimates of the cone dimensions, frequency (3.85GHz? ), and Q (6000 est?). 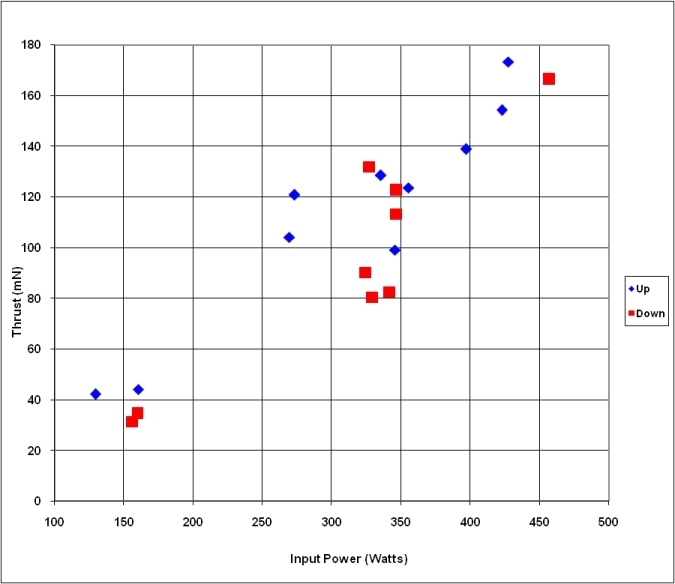 When I put in TM02 and 450W, I get 174.8microN, rather than the 174milliN reported. I would like to recheck those numbers. Even w/ Q=45000, I need to get X up around (65 Very high mode) to get those numbers. Is that possible w/ 3.85GHz ?? When thermal expansion displaces a part of a system relative to the rest of a system, the rest of the system will recoil. Whatever displaces a part of a system relative to the rest of the system, this displacement implies a force F_system_part. The rest of the system will recoil. Recoil is the acceleration due to the opposite force (F_part_system). An unrestrained, homogeneous, isotropic, free to expand but in one direction material, will produce a force when expanding against the wall against which it rests. Why is it so hard to reach consensus now ? With respect to the HD PE dielectric, now I see your thinking. I think you think of it as a dynamic problem, for example, if instead of the HD PE we would have an explosive inside the cavity glued to the left wall, the effect of the explosive would be to force the wall towards the left. However, thermal expansion does not work like that. There are no dynamic forces caused by a material experiencing thermal expansion such that it is free to expand. Thermal expansion is a very slow process that does not involve second order derivatives with respect to time. If a uniaxial isotropic material is glued to a wall, it will just expand without producing any force whatsoever on the wall it is glued to. If free, it will just expand, strain = alpha *deltaT. No stress if it is free to expand. Can't use thermal expansion as a form of propellant-less propulsion. In free space the CoM of the whole system don't move, but I would add : an outside hull's position can still be displaced if some part is moved inside. No net momentum gained at the end (no speed gained overall). For the part in blue : I don't see the qualitative difference you make between an explosive detonating on a left wall and a plastic block glued to a left wall and thermally expanding, in both cases it is thermal expansion. A material that expands is never completely free to expands, it must at least overcome its own inertia, even if slow quasi-static expansion occurs... Take for instance a slice of the material at the right of the slab, when the whole slab is heating, its distance from the left wall increase (meaning non 0 velocity), it has a mass, it was initially at velocity 0, so going from velocity 0 to some non null velocity implies an acceleration at some time, and this slice has a mass, so the rest of the slab had to push it, hence stress. The slower the process the weaker the forces, but weak is not 0. So maybe there is no leftward force of the plastic block expanding rightward during the phase of heating at constant rate if that means constant velocity of block's CoM, but at some time between start of heating and constant rate there has been a leftward force (on the wall). Likewise at some time between this phase of constant rate heating (constant expansion velocity) and stabilisation at constant position (end of movement to the right, 0 velocity again) there must be a deceleration, that is a leftward acceleration that corresponds to the block pulling the wall toward the right : if it wasn't glued it couldn't decelerate and would leave the left wall. The integrated forces between initial static position (at 0 relative velocity) and final static position (at 0 relative velocity) will be 0, since by definition the force (kg m/s²) when integrated is the exchanged momentum (kg m/s). So yes "Can't use thermal expansion as a form of propellant-less propulsion" in the sense that it can't give long lasting momentum (deltaV) to a spacecraft. But it can lend small temporary momentum to be paid back a little later, since it can give momentary speed, it can give long lasting displacement : by integrating the momentary "bump" in momentum(t) the craft of mass M will have shifted its position by X while the moving part of mass m has moved x, with MX=-mx (in kg m units). And from this point of view, this displacement is the same whether the mass m moved distance x fast or ultra-slowly. Equalling force terms to 0 because movement is slow would fail to predict that : weak forces for long time do the same "displacement job" as strong forces for short time. So a spacecraft A that is already at exact same velocity than spacecraft B but a few inches apart could dock to it just by shifting an inner part's mass. Obviously the mass shift can't be recycled to "inchworm" spacecraft's position again and again : to put the part at it's original position means losing the whole system's gained displacement. But the point is : that don't depend on the specifics of what makes the part move. So what's the point ? Regardless of what exactly would make a part move relative to another in the frustum, we know that 50µN for 45s, interpreted as a slowly occurring recoil effect (ever-accelerating part), amounts for an integrated "mass displacement" of .5*50e-6*45²=0.05 kg m that is either 50 grams moving 1m, or 1kg moving 5cm, or 10kg moving 5mm. Sorry, this is a repeat. 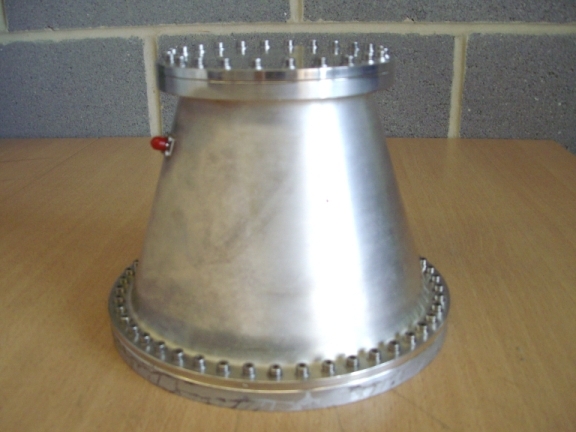 For what it's worth, I don't think the given numbers (265mm base diameter and 164mm axial height) can possibly be right for the inner cavity of the thruster in the photo- not unless whatever plates that are inserted within the ends are several centimeters thick. The only way that the height is only .6188 or 62% of the base diameter is if the 265mm base diameter is measured from the widest part of the exterior of the base plate, and the height is measured from where the slope of the exterior walls flattens out on top and bottom as roughly indicated by the yellow arrows in the attached photo. If that happened to be the case, then 189mm would be the exterior diameter of the top plate. But there's almost no way, in my humble opinion, that 265mm, 164mm and 189mm are correct for the inner cavity. Unless, again, the plates (diaelectric?) inserted inside the end plates in the inner cavity are several centimeters thick. I'm pretty confident in saying that. The distortion in the photo isn't nearly enough to account the discrepancy. I only point this out to maybe prevent some confusion, and now retreat to my recliner and leave the real work to minds more learned than mine. In summary, what do you think are the most likely inner dimensions? So I have data for everything except the mode(s), and temp size for the flight cone. What that means is TBD of course. There may be another variable involved, in or out of favor of a real effect. To be honest I'm a little baffled that the given numbers (265mm base and 164mm height) are so irreconcilable with the measured dimensions of the thruster in the photo. I'm pretty confident with my pixel scales. Is it possible that the dielectric plates you guys keep referring to, located within the end plates, are that thick? Is it possible that Shawyer would post the exterior diameter for the base instead of the inner diameter of the resonance cavity? Also, from reading Mullerton's posts, it seems that the frustum walls are maybe only a few mm's thick. Is this correct? For a given temperature change, the "speed of thermal expansion" is constant (it is proportional to the speed of sound in the material), the derivative of a constant is zero. There is no first order derivative with respect to time for the speed of sound in a material: it is zero. The speed of sound is a constant. For a given temperature change,, there is no second order derivative with respect to time for thermal expansion: it is zero, because it proceeds at constant speed. There is no "acceleration of sound" in a material, not in High Density Polyethylene. For a given temperature change, there is no "thermal expansion acceleration". An explosive blast has acceleration. For a given temperature change, thermal expansion does not. Not everything has acceleration. Some phenomena proceed at constant speed. Sound has a constant speed in a material. Light also has a constant speed. For a given temperature change, thermal expansion proceeds at a constant speed. 164mm height (given by Shawyer). Here's the chart if anyone is interested, cluttered though it has admittedly become. Thanks! That brings that X number down to ~55. Still a very high mode, but 3.85GHz ! I understand that you need to use X=26 in your equation for Shawyer's Demo, also a high mode. On the other's hand McCulloch's equation gives thrust forces greater by a factor of 2 to 20 times for NASA Eagleworks test results, and your equation may compare better than McCulloch's for NASA's tests. On the other's hand McCulloch's equation is off by a factor >10 for NASA Eagleworks test results. That is an interesting fit. Of course I havn't seen Mike's derivation in 3D. I only follow the Equivalence argument the best I can w/o fudge factors and see what comes out. At the moment I think these are maximums if you have all the parameters and I like the NASA results because they seem to have eliminated more sources of error. Still, it may all be fiction which is what we want to find out. Please, I'm not accustomed to such tools as those used for thermoacoustics. There is not enough of a life to learn all... Just applying more rudimentary reasoning : my slab of PTFE, volumetrically heated, free floating alone, would expand as much leftward than rightward. If glued to a left wall inside an heavy hull, it will expand more rightward than leftward (in the same inertial reference frame) : necessarily it means that at some time there have been a force of the wall on the slab, otherwise a solid object as a wall wouldn't have been needed to prevent the slab to expand leftward. If such wall exerted no force at all, the slab would have expanded through the wall as if it didn't existed. Ahem. Please define the "speed of thermal expansion" that is supposed to be constant, I don't get it. What changes with time (very slowly, due to the low thermal diffusivity of HD PE) is the temperature. So, one has to solve Fourier's equation (temperature vs time). And the thermal expansion and thermal stresses follow from that. There is no second order derivative with respect to time in Fourier's equation. There is only a first order derivative with respect to time, and other terms containing a second order derivative with respect to space. There is no "acceleration of temperature term in Fourier's equation". Hence no intrinsic "thermal wave Fourier equation". No "inertia of temperature" term and no "inertia of thermal expansion" term. You may compute a thermal strain changing with time due to the temperature changing with time: T(t) hence epsilon(t)=alpha*T(t), and a strain rate also changing with time (due to the change with time of the temperature). The coefficient of thermal expansion is very small, by several orders of magnitude. There is nothing there to produce a large acceleration of thermal deformation term. The "acceleration of thermal deformation" in HD PE should be negligible, and when you multiply it by the mass it should give a negligible force. Such dynamic terms are neglected in thermal problems. Even in the Pioneer anomaly problem, involving extremely small accelerations, what is discussed is the thermal radiation producing recoil forces, but nobody has brought up "thermal expansion forces due to the thermal expansion changing with time", one reason for this being that such thermal expansion cannot accelerate the center of mass for an object free in space, of course. But no issues of "acceleration of thermal expansion" bringing dynamic forces on the antenna either. Interesting thing to note: Shawyer claims the engine starts to accelerate only when the magnetron frequency locks to the resonant frequency of the thruster, following an initial warm up period where it does not move; thus according to him eliminating possible spurious forces. That's very interesting stuff. Thank you for bringing it up. Do you have a reference as to where Shawyer made that interesting claim? The frequency offset curve shows that initial magnetron thermal drift ends with frequency lock. At this point, 130 secs into the test run, the velocity data shows the start of acceleration under power. The prior thermal drift period, with no acceleration, shows that the thrust is not a result of spurious thermal effects. When the power is turned off, at 210 secs, there is a coast period as the slosh effects of 5kg of coolant maintain a reduced acceleration. This is followed by the deceleration due to the friction torque. A maximum velocity of 2cm/s was achieved and a total distance of 185cm was "flown". I don't understand this "slosh effects of 5kg of coolant maintain a reduced acceleration". For any acceleration to occur there has to be a force acting on the device. The coolant is part of the device; it is balanced on an air bearing like everything else. When does the coolant pump switch on? If the coolant pump is controlled by a temperature sensor maybe it gets switched on at 25 Sec. when the magnetron gets to a setpoint temperature. That could produce a torque since a mass is being accelerated. The dynamic test results, fig. 10 of the IAC '08 paper referenced in the paragraph above this quote does show continuing acceleration after the RF power was switched off. Pumping coolant out of a reservoir and through the magnetron's cooling channels could be the reason for the change in velocity. A quick search finds examples of injection locking of magnetrons driving a cavity. This is done by feeding a low level signal at the desired frequency into the magnetron cavity. Locking a magnetron to the resonant frequency of an external cavity is something else. If Shawyer's device is locking the magnetron to the desired frequency it shouldn't take 25 Sec. Maybe someone can correct me here. EmDrive is already discussed as well on the LinkedIn. In the group called "Advanced propulsion" There are 1600 + members in this group. There is already one recent article on the EmDrive and it brings the attention of people from science and public community. I am doing this mostly to try to bring more attention of the media and public to this technology and perhaps more funds for this project at NASA. Also please - If you can like the article . I know it is way too enthusiatic, but that is the way to bring the attention of public. More likes bring the article to wider public. I begin to see more clearly why we are not really talking of the same thing, I never said there is a large acceleration of thermal deformation term, I said however small it is nonetheless !=0 and accompanying reaction force!=0. This is usually negligible and generally neglected (assumed to be exactly 0) because for most situations it makes no significant difference, and indeed even for very small acceleration effects like for the Pioneer anomaly this would be irrelevant, because in this case what is to be explained is a very small but long lasting acceleration leading to accumulated deltaV. Pioneer telemetry can track extremely accurate velocity and velocity changes but wouldn't mind a one shot position shift of a mm or so (that occurred only once, at warm-up). But please consider the following situation, a 11kg free floating spacecraft A with its hull 500µm to the left from hull of spacecraft B. Both velocities exactly the same (500µm stable distance, neglecting gravitational or other coupling). On a left inner wall of A is glued a 10cm sided cube of hdpe, about 1kg (give or take). Now this block is heated so that its temperatures goes from 20°C to 30°C. Let's say thermal expansion coefficient of hdpe is 120e-6 (m/m)/°C (this is for piping, maybe a little different for a cube) the horizontal size of the cube is now 120e-6*.1m*10°C = 120 µm longer. The CoM of the cube will be 60µm to the right of initial position, as a result of conservation of system wide Com, the rest of the spacecraft A of mass 11-1=10kg will have seen a shift in position to the left of 1kg/10kg * 60µm = 6µm. Hull of A is now 506 µm from hull of B. This is one shot displacement, if the cube is to cool down to 20°C and contract to initial position, the initial hull to hull distance of 500µm is restored. In this very specific case, which is arguably quantitatively relevant for the experiment at hand, what is usually neglected can't be neglected. F(t) != 0. But I would agree that it makes no difference in the way to proceed with calculations : when assessing the dynamics of heat conduction and expansion, first proceed as usual (negligible inertia relative to expansion accelerations). Then from those position(t) curves, the tiny inertial reaction forces can be derived, if needed. Edit: to be perfectly accurate, since the hull of mass M is recoiling leftward X absolute while the block of mass m is shifting rightward x absolute, if we know there will be a relative displacement rd=x+X, mx=MX gives m(rd-X)=MX => (M+m)X=m rd => X=m/(M+m) rd so with rd=60µm X=5.45µm : the distance between A and B will go from 500µm to 505.45µm. 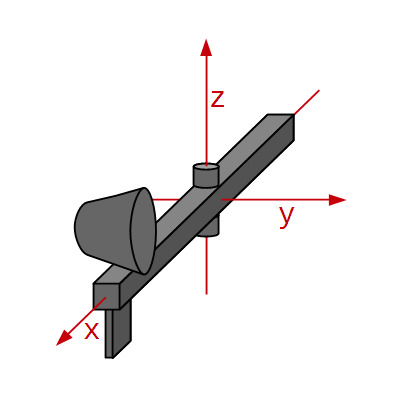 if a thermal displacement (again) of a part of significant mass relative to the fixation point can occur, this will change the torque seen by the balance arm around the x axis. (See attached picture for naming conventions). While the flexure bearings make for a very stiff reaction around x and y axis (compared to the natural rotation around z) no stiffness is infinite. Likewise, the Faztek beam could twist a little around the x axis. Since the distance reported in the charts is measured (along the y axis) from a plate below the beam, any increased rotation clockwise would increase this distance. So, this is on shaky ground on orientations considerations alone, but I'd be curious to know the amount of rotation stiffness around the x axis, maybe that was discussed already ? Side note : I'm trying to know the exact model of flexure bearings used. From this post we know that <<The Riverhawk C-flex torsion bearing's spring constant is a nominal 0.007 in-Lb/deg.>> but that doesn't add up with the vertical readings in the charts (from calibration pulses, between 0.033µm and 0.1µm per µN on vertical scale, with still unexplained disparity from chart to chart).